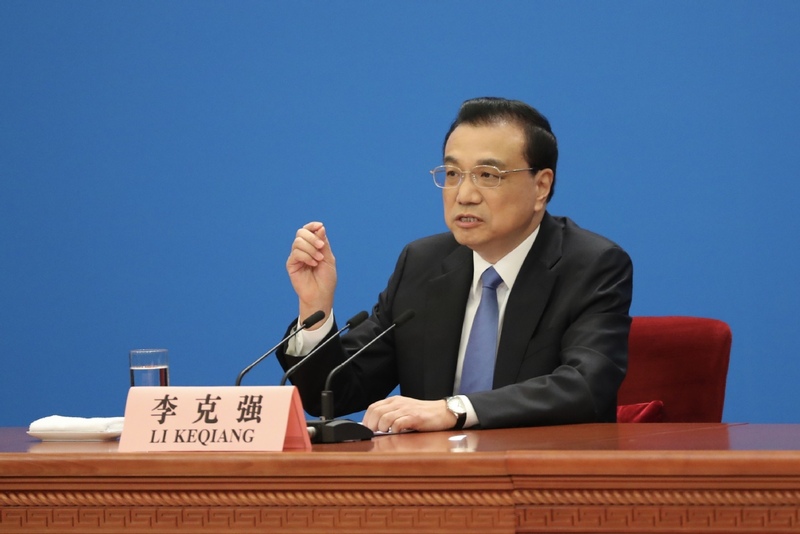 It is true that China's economy has encountered new downward pressure, as part of a global trend, said Premier Li Keqiang. Last year, people across China made a strong united effort to advance our supply-side structural reform and achieved the GDP growth goal of 6.6 percent, said Li, adding that the country has sent a message of stability to the market. China will not use large-scale quantitative easing to bolster the economy and instead will boost market vitality through measures such as tax and fee cuts to stabilize economic growth and seek high-quality development, noted Li. Chinawill cut the value-added tax rates April 1 and lower the social insurance fees from May 1. Tax and fee cuts will be nearly 2 trillion yuan ($297.5 billion yuan) this year, a key measure to cope with current economic downward pressure. Chinais committed to a denuclearized Korean Peninsula and hopes that peace and stability will be maintained. Parties involved in the peninsula issue should be patient and see opportunities, especially positive factors to promote dialogue. The supply of nursing services for the elderly and infants in China is insufficient and cannot meet demand, and this situation deserves the highest attention. The government should take more measures to encourage private investment to develop the services, but effective supervision is needed to ensure such services are safe. Common interests between China and the United States far outweigh differences. Sino-US economic decoupling is "not realistic". Chinahopes that the current trade talks with the United States will generate mutually-beneficial outcomes. Such a result is also what the whole world would like to see. To further improve the business environment, the government will continue to focus on streamlining administrative approvals and delegating power to lower levels, as well as on improving regulation, Li said. Chinawill ensure that companies of all types of ownership will stand to benefit as equals from the measures of administrative streamlining, he added. The Chinese mainland will introduce more preferential policies toward Taiwan residents to ensure that they will enjoy the same treatment as mainland people when they study, work or start businesses on the mainland, according to Li. The employment-first policy has been included as one of the nation’s three macro-policies, together with the fiscal and monetary ones, for the first time this year, to better secure employment, said Li. The government will take stronger moves to secure employment of some key groups including college graduates, retired military personnel, laid-off workers and migrant workers. Chinawill not take advantage of any third party or target their interests. Trade disputes are an issue between China and the United States. Chinawill introduce a series of regulations and documents in accordance with the foreign investment law to protect the legitimate rights and interests of foreign investors, Li said. The law will offer better legal support to the protection and attraction of foreign investment, as well as regulate government behaviors, Li said. China and Russia need to make use of all possible means to keep the $100 billion two-way trade stable and work further to double it. The two countries could expand cooperation in areas like trade in commodities, cross border e-commerce, aviation and aerospace and also enhance exchanges at the sub-national level and between their peoples.